Today, I have the chance to talk about a really cute Bible Stories product. 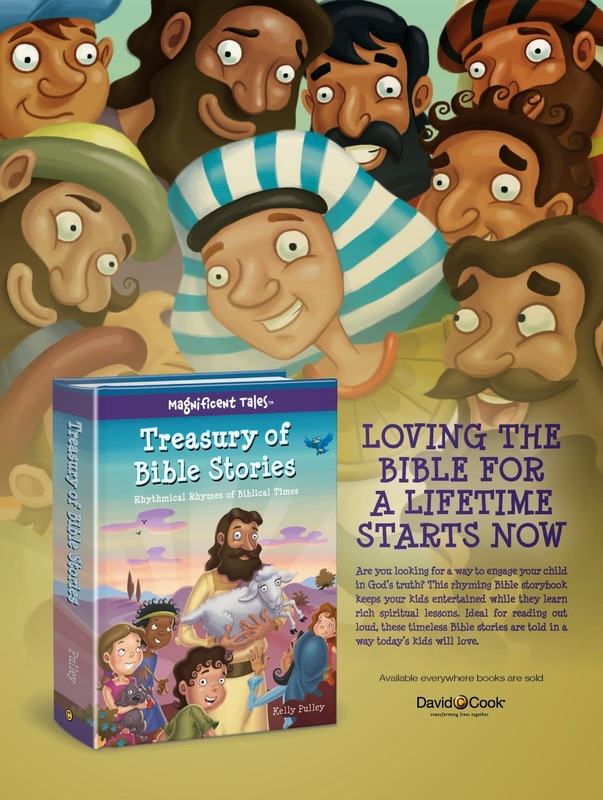 Treasury of Bible Stories, by Kelly Pulley, is put out by David C. Cook Publishing. This hardcover book is available for $14.99, and is intended for kids aged 4-8. Trina, my baby, is 8, putting her at the upper end of the age range. She enjoyed listening to the stories, but since she is fairly familiar with the main stories of the Bible already, she thought this was a little young for her. Her feeling was that this would be great for about the 3-6 year old range. I think for kids who haven't had a lot of Bible before, that 8 is still appropriate. This Bible features twenty stories in total, with a dozen from the Old Testament, and eight from the New Testament. It is mostly the stories you expect to find in a Story Bible (Joseph, David and Goliath, Jonah, Daniel in the Lion's Den) but also at least a couple stories that aren't quite as common (Gideon, for example). The rhyme is very easy to read aloud, and the pictures are filled with detail, so the youngest listeners are likely to stay interested. My 3 1/2 yr old daughter would love this.